Located on the Perfume River, Hue's misty atmosphere reminds visitors of its once mysterious imperial past akin to China's forbidden city. 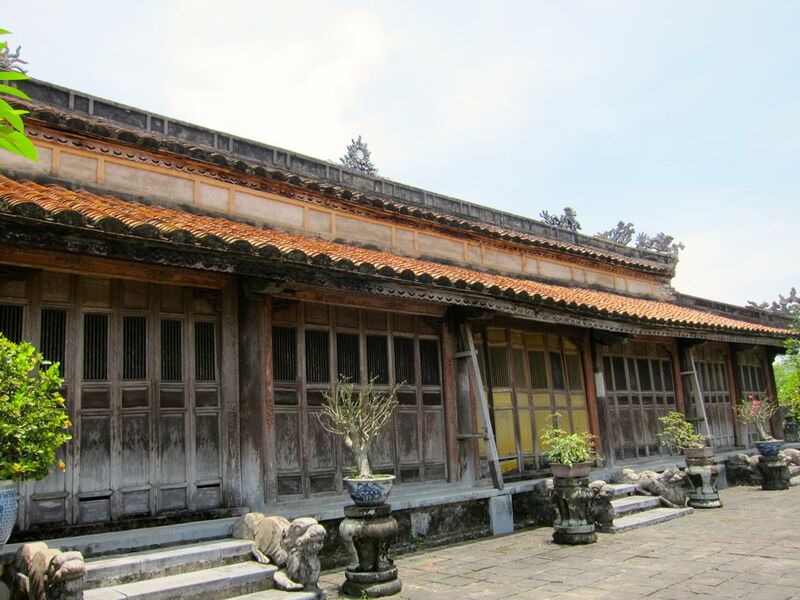 Hue was the centre of the Nguyen dynasty which ruled this place from 1558 to 1945. 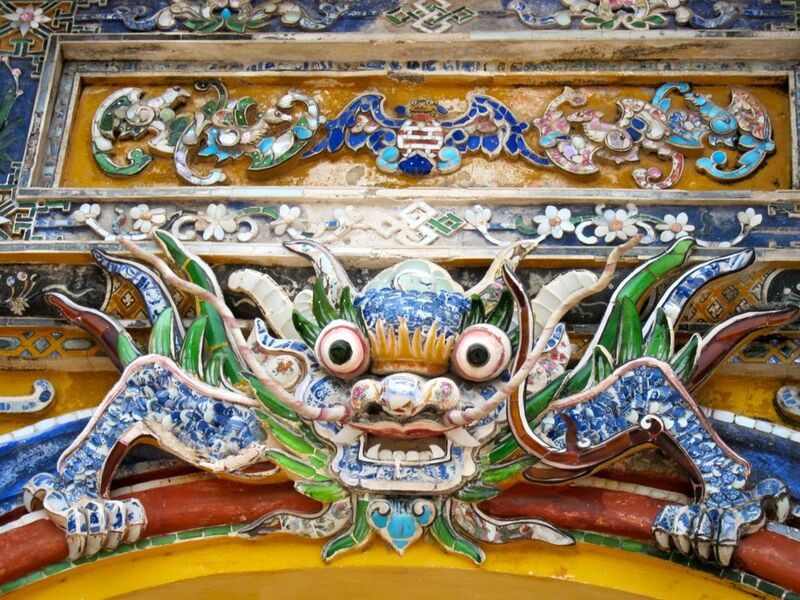 The legacy of this long reign left Hue with many places to explore and interesting things do. 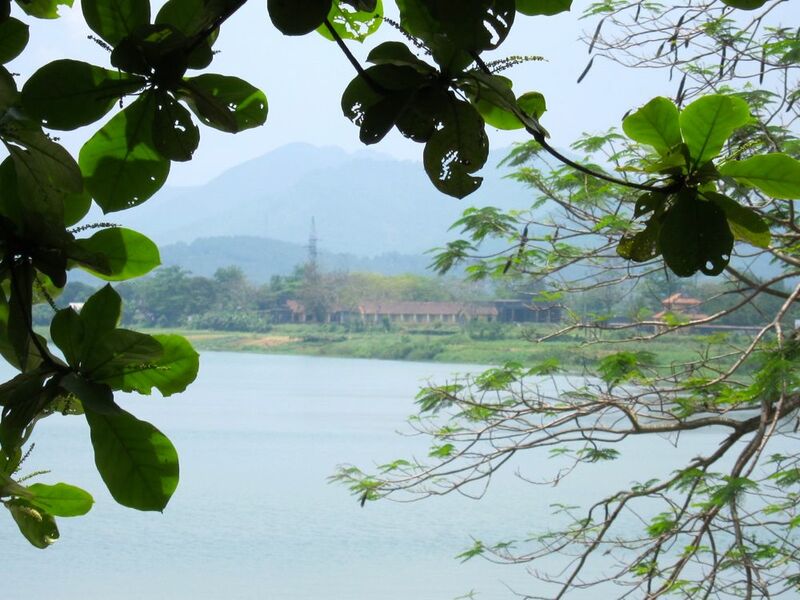 ​In spite of the influx of tourists, Hue has retained its charm as a quiet little town. But maybe not for long. Declared a UNESCO World Heritage in 1993, this former royal city of Vietnam just feted its 2 millionth tourist with flowers and gifts. Today, many more visit this charming ancient city. Though devastated during the Vietnam War (remember TET? 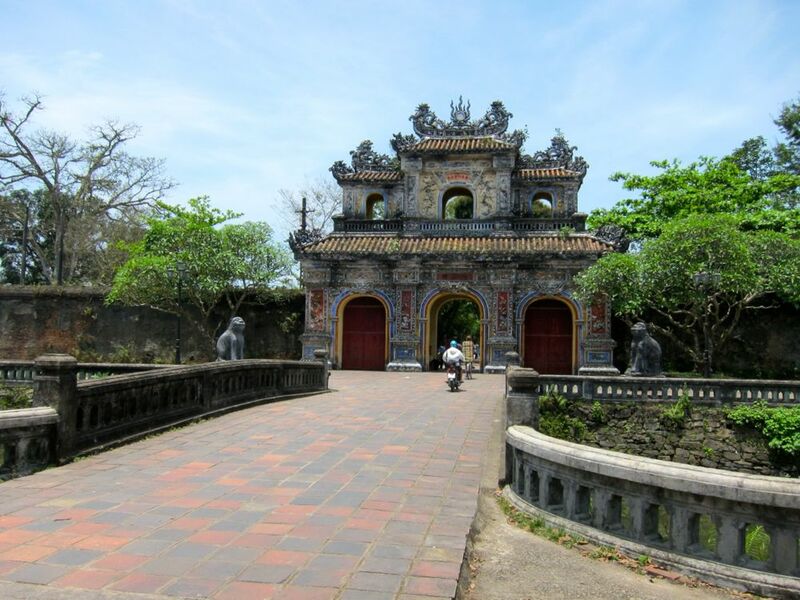 ), Hue has still a sampling of the Nguyen palaces, temples and pagodas as well as the tombs of these early Vietnamese rulers. Hue has been the seat of the powerful Nguyen rulers and it has more than a few bastions of the later French rule of Indochine. Finding monuments and old buildings is rarely difficult, but if you want the sense and feel of history, a little effort is needed. Although we had been wanting to visit Hue because of its history, we were not there by choice. The gods must have listened as we missed our flight coming from Hoi An to Ho Chi Minh. Vietnam Airlines just kept delaying flights in our itinerary and this was the worst because we finally decided to sleep in Hue after a full day wait at the airport. Four flights, four disasters...a new record for us in completely dysfunctional airlines! The first delay was great as we had a chance to go around and see the city. 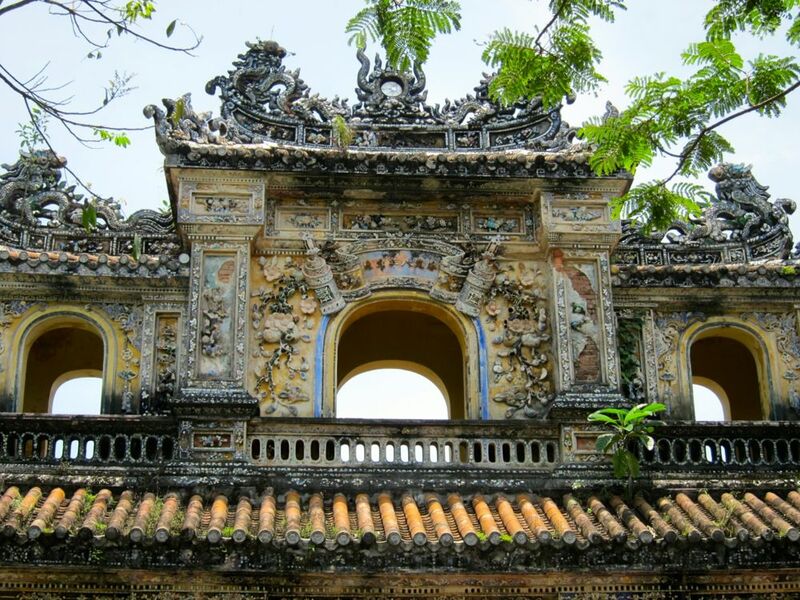 ​We rented a car and just went for an instant tour of the must see places in Hue. It was a glimpse at Vietnam's past and we really lucked out with the driver, so it was impressive, informative and entertaining. 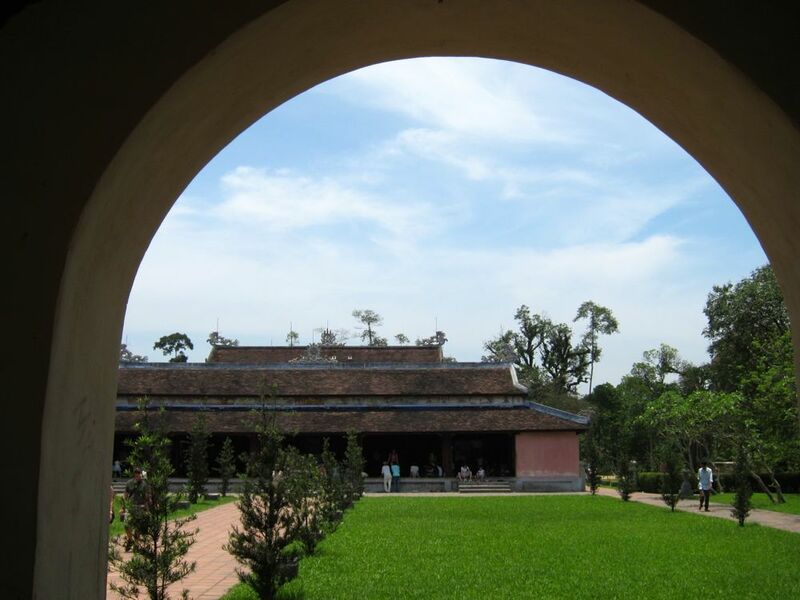 If you are interested in history, make Hue's Citadel your top destination. The pagodas, temples and imperial tombs are worth seeing after you have explored. The Citadel and the Forbidden City will take almost a day to explore. Started in 1804, the Citadel is a 2 meter thick, 10 km long walls within which is the Imperial Enclosure. Towering over the Citadel is the Flag Tower and on its gates are the Nine Holy Cannons, the symbolic protectors of the kingdom. The four cannons near Ngan Gate represent the four seasons and the five next to the Quang Duc Gate represent the five elements: water, earth, wood, fire and metal. At the center of the Imperial Enclosure is the Forbidden Purple City, a walled compound solely for the use of the emperor, and around its perimeter are residences and temples mostly for Royalty and their court. In the very center of the enclosure is the Forbidden City, a walled compound solely for the use of the emperor. Take a good look at the main entrance, Ngo Mon Gate. Its facing the 37 m. high Flag Tower. To either side of the Flag Tower are the Nine Holy Cannons; four of these represent the four seasons and the five represent the five elements: earth, water, fire, metal and wood. Another place of interest in the imperial city is the Thai Hoa Palace, a big hall with ornate timber roof used for imperial receptions and coronations. Just behind the palace are the Halls of the Mandarins used as offices. There are more places to explore such as the To Mieu Temple, the Dien Tho Residence, the Troung San Residence, the Royal Theatre. 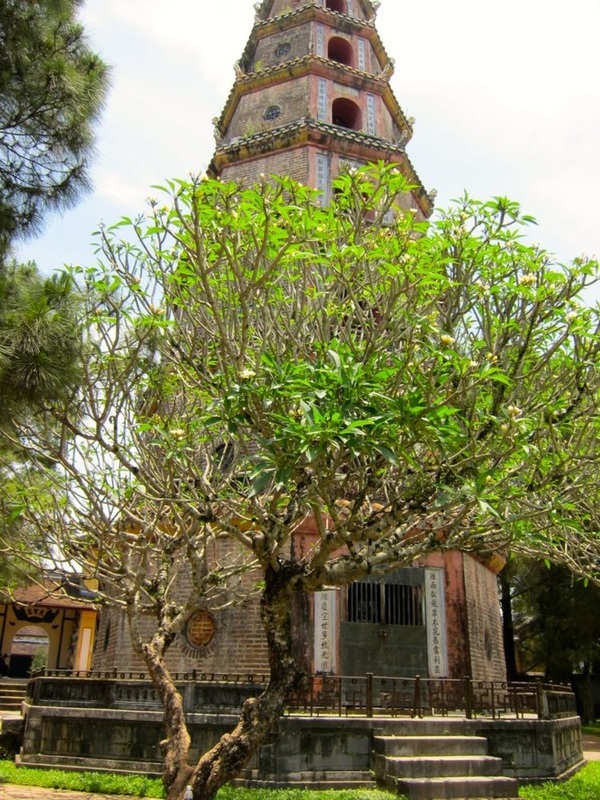 Spend another day at the pagodas foremost of which are the Bao Quoc (1670) and the Dieu De National Pagoda (1841). 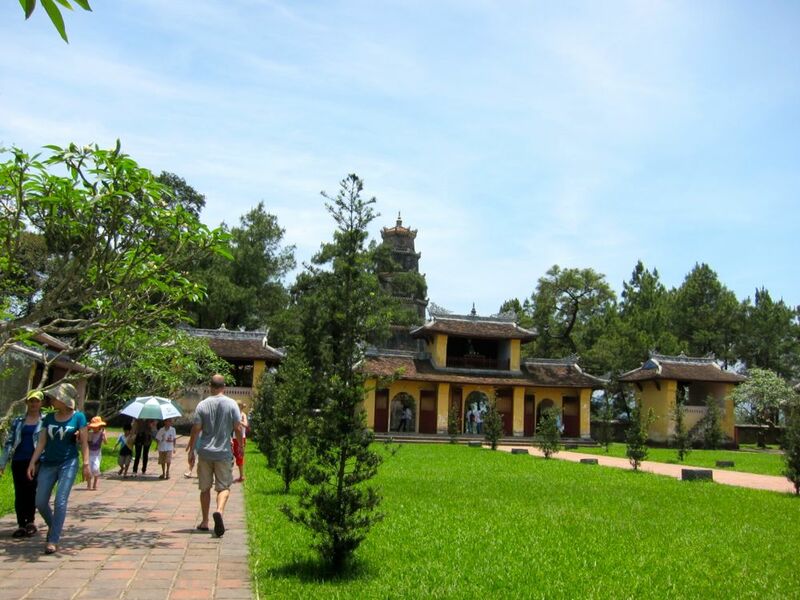 Don't miss the Thiun Mu Pagoda, originally founded in 1641 and the Tu Hieu Pagoda where the famous master, Thich Nhat Hanh, entered to become a monk. Worth a visit is the National School, a secondary school founded in 1896 by Vietnamese president Ngo Dinh Diem's father, Ngo Dinh Kha and boasts as students some of Vietnam's prominent figures such as the famous Vietnamese general, Vo Nguyen Giap, Pham Van Dong, former North Vietnam's premier, Do Muoi, former communist party secretary general and prime minister. Even Ho Chi Minh studied in the school for a while. Also explore along the banks of the Perfume River, the magnificent tombs of the Nguyen rulers. After a long walk around the citadel, other things beckon. If you are more adventurous, drive to Da Nang or Hoi An for dinner and fun. Or head to the Beach. The closest is about 45 minutes. Have a good dip in the ocean. Cruising the Perfume River is quite enjoyable. 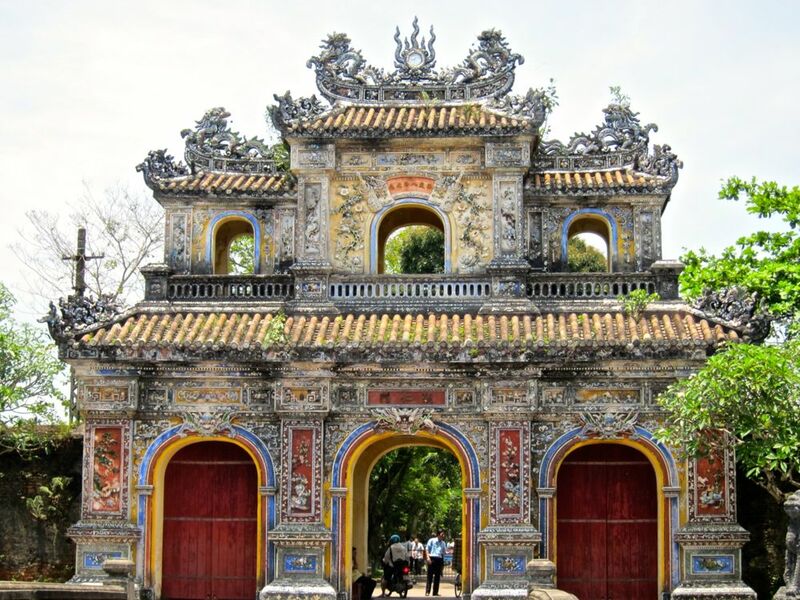 A journey along the Perfume River will bring you to the Thien Mu Pagoda and several royal tombs including that of Tu Duc, Mihn Mang and Khai Dinh. The boat trip ranges from $3 upward. You can also charter a boat. This biennial festival has taken on the world stage with visiting artists from many countries presenting their work and the Vietnamese in Hue showcasing their royal theatre, music, dance, art and puppetry mostly performed at the Hue Nguyen court in the past. Most of the festival activities are held at the Hue Citadel, where most of these performances were shown in the past. Hue just recently commemorated the 10 years of the inscription of this Royal Court Music in the list of the intangible cultural heritage of humanity. This used to be a national event during the Nguyen reign. Today, the performance is usually held in the platform about 2 kilometres west of the Imperial Palace. This platform was built by the early Nguyen rulers using soil from different parts of the country. With bands playing court music, a formal procession of kings and mandarins, recently played by actors dressed in the costumes of the Nguyen rulers and accompanied by horses and elephants, walked from the palace to the Pavilion for the rituals. Locals lit incense at the platform. Drink a cold Huda, Vietnam's finest beer, on the banks of the Perfume River. Sample Hue's dishes which originated from the Nguyen rulers. Said to be fuzzy about food, the Nguyen court has developed some of the finest recipes to please their rulers. Drink ca phe sua, Vietnam's famous milk coffee. The best places are the floating bamboo platforms surrounded by lotus flowers. Tranquil and refreshing after the foot challenging tours. Try Vietnam's sugar cane juice to replenish your energy. 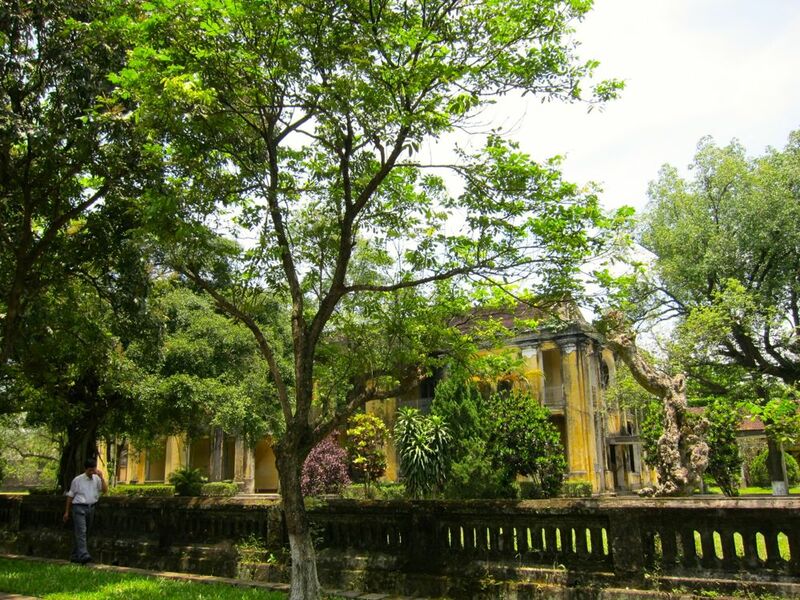 If you love gardens, visit and enjoy Hue's traditional garden houses. 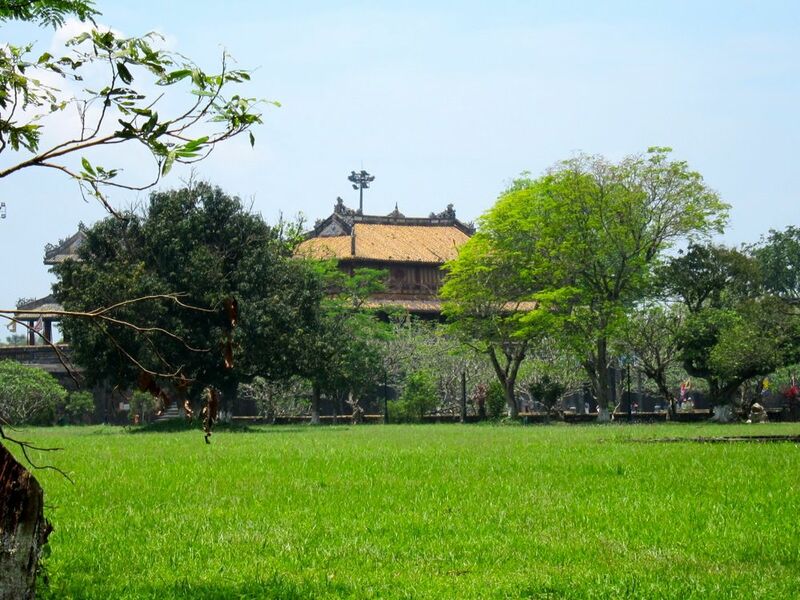 Until 1945, Hue has been the seat of the powerful Nguyen dynasty founded by Emperor Gia Long. As early as the late 1700, these powerful Nguyen rulers built the city but it did not take much for the French to strip it of anything of value and sideline the Nguyen rulers from governance. So, Hue lost its prominence in Vietnam until 1968 when The TET offensive took the world's attention and placed Hue once more in the international map. As the only city in South Vietnam to be occupied by the Vietnamese National Liberation Front, it became the scene of a vicious battle in the TET offensive when South Vietnamese and US forces fought hard to take it back. It was destroyed and with its monuments, more than ten thousand people killed including 150 US Marines. The Siege of Hue was one of the longest and bloodiest battles of the Vietnam War. You can fly to Hue from Hanoi or Ho Chi Minh City and pray your flights will not be messed up. If you are already in Da Nang or Hoi An, Hue is an easy drive. You can take a day trip to Hue from those places. From Laos, there is a border crossing, Lao Bao-Dansavahn, which is about 152 kms. from Hue. You can get visas to Laos at this border but you can't get a Vietnamese visa. Arrange for this beforehand in your own country or from Laos. It is easy to get a visa from any Vietnamese embassy. OK...if you are a die hard back packer, you can get buses from almost anywhere to anywhere in the Mekong countries for a pittance, but for the...ahhhhhh.......mature tourist, the plane should be the answer. Thanks for your visit. What other things in Hue would you recommend to visitors? Please give your suggestions below. 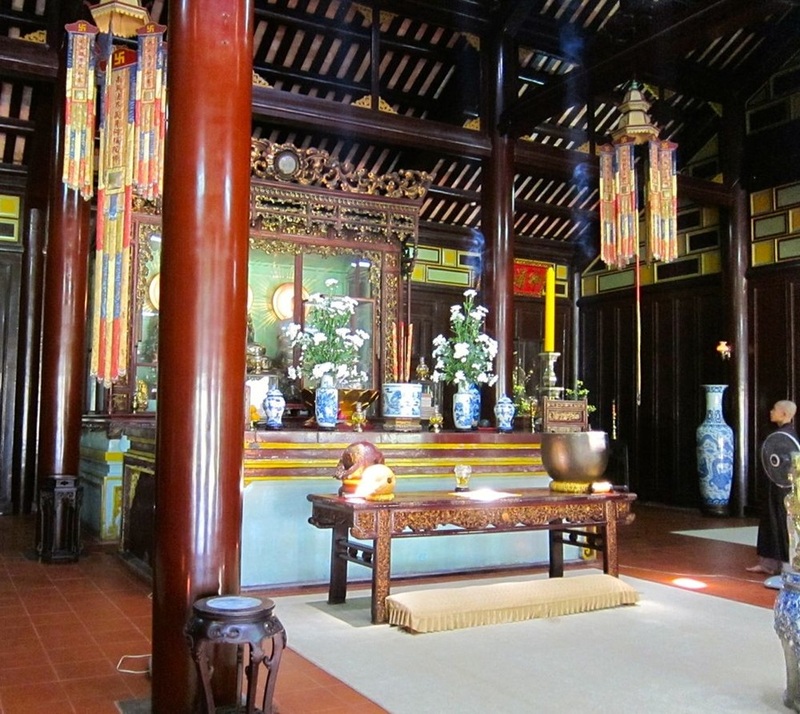 It was here in Hue that Thich Nhat Hahn started his religious life formally. He moved to France where he started the meditation place and lives there now. No other book has influenced my meditation as this one written by Thich Nhat Hahn. His own life and meditation practice has led him to understand what the essence of meditation is. If you want to practice meditation, read this book from a master.